Transform your body and your lifestyle into a healthy, lean, and toned version with this mini stepper. 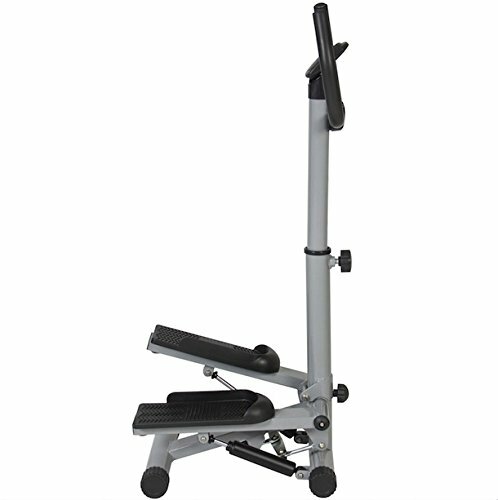 The stepper is designed to help you reach new goals and provide an efficient workout that targets the leg muscles without damaging the bones and joints. The stepper contains patterned plates to prevent any possible slips, but to be more secure there is a stabilizing bar in front that helps one keep their balance. The stabilizing bar can be adjusted to a desired height and it also contains a small LED screen that displays the time, calories burned, step counts. Transform your body and your lifestyle into a healthy, lean, and toned version with this mini stepper. The stepper is designed to help you reach new goals and provide an efficient workout that targets the leg muscles without damaging the bones and joints. The stepper contains patterned plates to prevent any possible slips, but to be more secure there is a stabilizing bar in front that helps one keep their balance. The stabilizing bar can be adjusted to a desired height and it also contains a small LED screen that displays the time, calories burned, step counts. If you have any questions about this product by Auténtico, contact us by completing and submitting the form below. If you are looking for a specif part number, please include it with your message.